MINUSMA peacekeepers patrolling the streets of Kidal, northern Mali. It is one of the most dangerous UN peacekeeping missions. 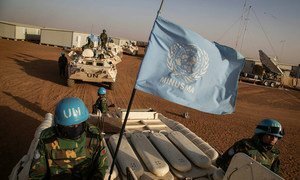 United Nations Secretary-General António Guterres and the Security Council have strongly condemned an attack on UN peacekeepers in Mali and underscored that such attacks may amount to war crimes under international law. Two Chadian peacekeepers were killed and at least ten others injured when a camp of UN mission in Mali (known by its French acronym, MINUSMA) in Aguelhok, Kidal region, came under mortar attack at about 18:45 (local time) on 5 April. According to the UN mission, immediate medical evacuations were organized and the security of the camp strengthened. In a separate statement, the Security Council also denounced the attack and called on the Government of Mali to swiftly investigate the incident and bring the perpetrators to justice. They also stressed that involvement in planning, directing, sponsoring or conducting attacks against MINUSMA peacekeepers constitutes a basis for sanctions designations pursuant to Security Council resolutions. The UN mission in Mali is one of the most dangerous, with over 160 peacekeepers having lost their lives in the country. In late February, four peacekeepers were killed when their convoy came under attack in Mopti, central Mali.